In Greek mythology, the place of honor lay in the mythical Garden of the Hesperides, cultivated by Hera the wife of Zeus. Even today the orange is like a queen on the table: a delight to the palate and a source of health. Typically a winter fruit, the orange is native to China and Southeast Asia. It was imported to Europe only in the fourteenth century by Portuguese sailors. It blooms in April. Its flowers, the orange blossoms, are delicate and intense, and a symbol of fertility and purity. Our oranges belong to the navel variety. It is a premature fruit, so it is already ripe on the middle of november. Its sweetness is higher than the average of the other variety of orange. The first orchard was planted in our land in the 1994. Since then our plants yield juicy and scented fruits. 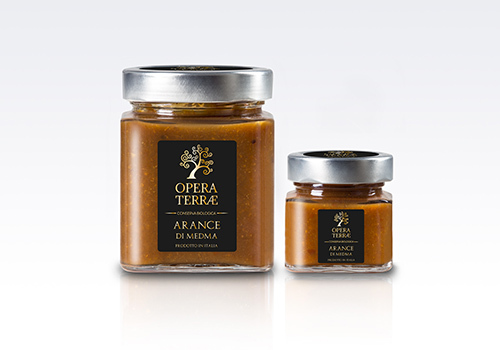 Organic orange preserve without added sucrose. Ingredients: organic orange, organic apple juice. Fruit used: 120g for 100g of finished product.